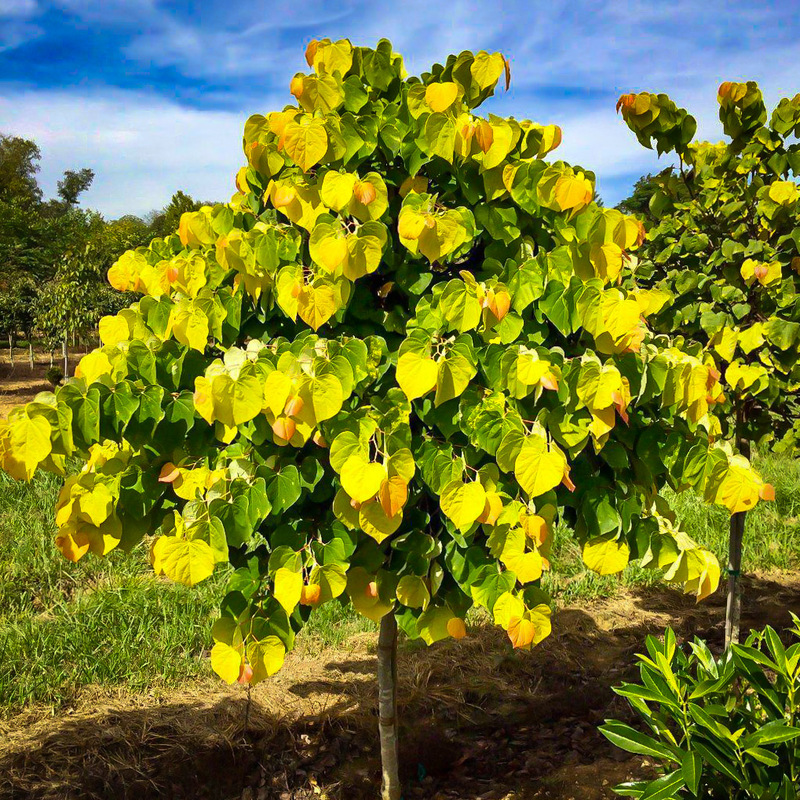 The Rising Sun Redbud is a spectacular new variety of this spring flowering tree, which features extraordinary foliage, beginning in spring a gorgeous deep apricot. As they mature the leaves turn gold, yellow and then lime-green for the summer. All four colors will be present for several weeks. In very early spring the bare branches are smothered in brilliant fuchsia-red flowers, glowing out. With its handsome, dark reddish-brown winter bark, and twisted growth habit, this is a tree for every season of the year. 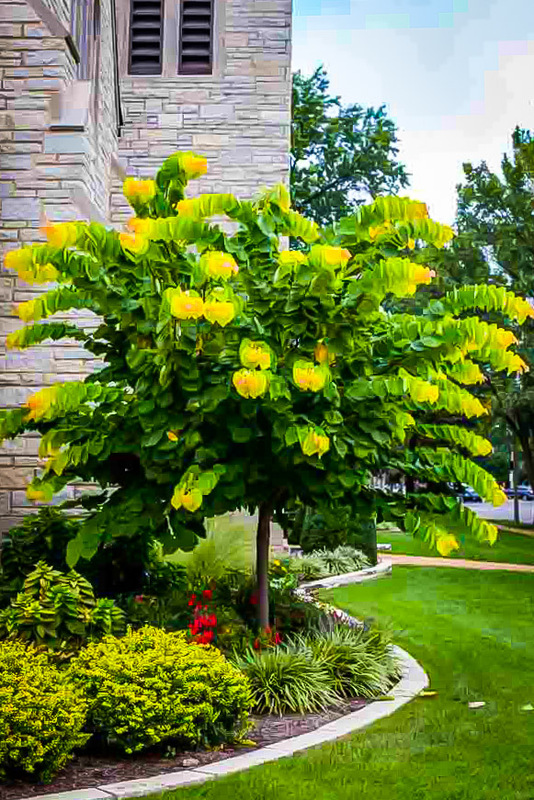 It grows between 8 and 12 feet tall, spreading to around 8 feet wide, and it makes a spectacular specimen on a lawn, among other flowering trees and shrubs, or bordering natural areas. 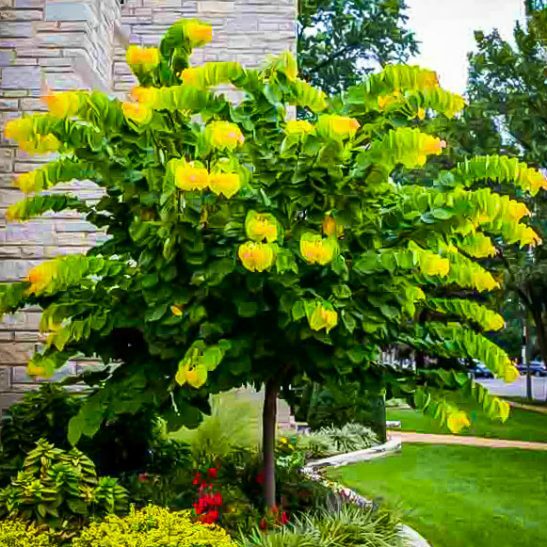 It is a variety of a native tree, so it is ideal for natural planting too. The Rising Sun Redbud grows well in full sun, without the foliage burning in hot, drier summer weather. Full sun will give the strongest foliage colors, but this tree will also grow well in partial shade, such as beneath taller trees. It is hardy from zone 5 to zone 9, and in sheltered locations in zone 4 as well. It thrives in any kind of soil, including poorer soils, both acidic and alkaline, but not in wet, poorly-drained soil. It has no important pests or diseases, and it is fast-growing too, so you will soon be enjoying its spectacular beauty at full scale. 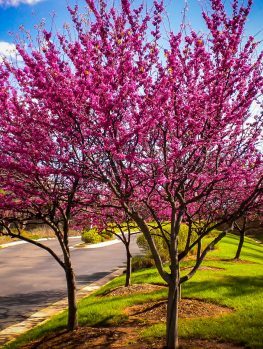 Many gardeners are familiar with flowering spring trees such as cherries and crab apples, but strangely the spectacular redbud, which is also a native tree, is less well-known, and not planted nearly enough. Before other trees and shrubs have even woken up from the winter, the glowing fuchsia-red flowers on the bare branches of the redbud can be lighting up your garden, looking like a visitor from the tropics, so vibrant and powerful is the coloring. Easy to grow, cold-hardy, tolerant of sun or shade and a range of soils, we really should see this tree in every garden. Perhaps the problem is that after flowering, although the leaves are attractive, being 3 -5 inched across, round, with a heart-shaped base, it is just another small green tree. 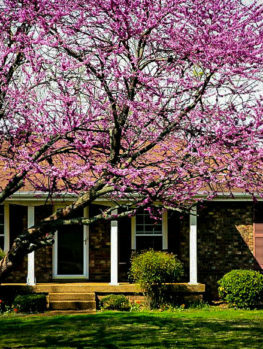 At least, that is how things used to be, before the arrival of The Rising Sun Redbud, which turns a spring-flowering tree into a spectacular colorful foliage plant for all three seasons. 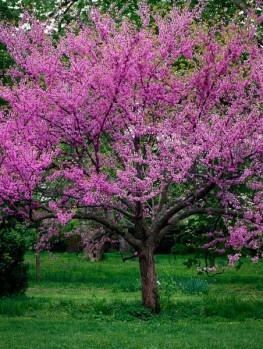 The Rising Sun Redbud is a unique form of this beautiful tree, with the same spectacular flowering on its bare spring twigs, but that is only the beginning. When the heart-shaped leaves first appear they are deep apricot. As they mature they turn gold, and then yellow, but because more new leaves are appearing at the ends of the shoots, all three colors are present at the same time, creating a wonderful kaleidoscope of changing colors. As spring turns into summer, and new growth for the year is over, the leaves turn a beautiful lime green. If you examine the leaves more closely you will see they are speckled, in both lighter and darker shades, which creates a richer and more dynamic coloring when seen from a distance. This beautiful color glows out across the garden all summer long, standing out against the deeper plain greens of the other trees and shrubs in your garden. Then in fall, as the colors around change, the leaves turn a beautiful shade of light yellow, highlighting the brighter colors of the other fall trees around it. Even in winter the attractive twisted stems and branches of the tree catch our attention. The bark is smooth and deep red-brown, becoming almost black and furrowed with age. 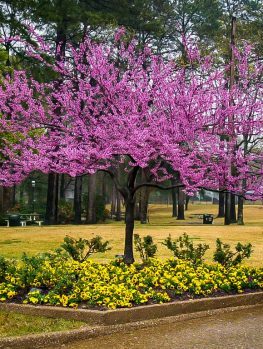 Imagine The Rising Sun Redbud as a specimen on your lawn, or perhaps planted above smaller shrubs. It will create an ever-changing picture from the earliest days of spring, through summer and into fall. No longer just a spring splash and nothing else for the year. 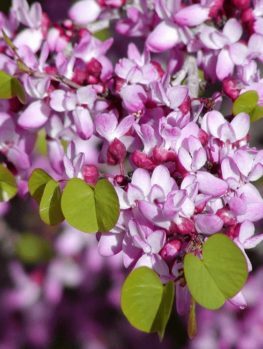 Eastern redbud is a native tree naturally found in wooded areas, and it fits perfectly on the edges of more natural parts of your garden, creating a transition from the colorful garden plants into the calm of the woods. Place it in a bed of mixed shrubs and small trees, to create a wonderful tapestry of ever-changing colors and flowers in your garden – nothing could be better. 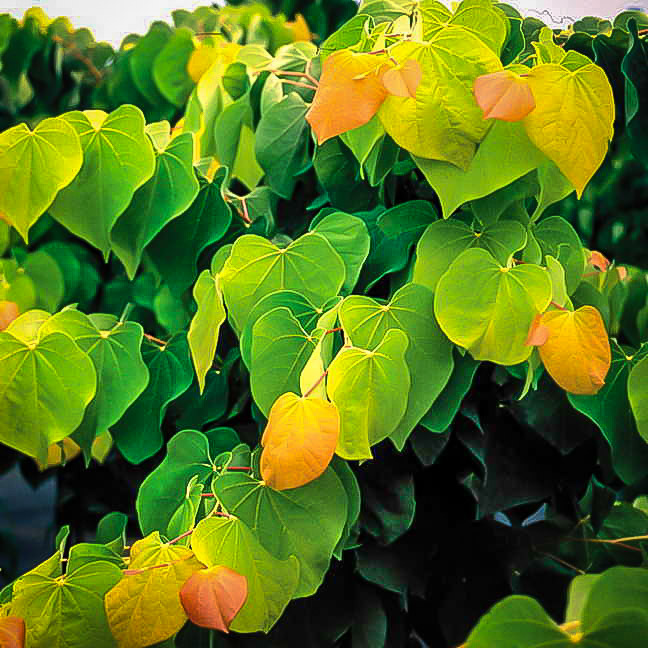 The Rising Sun Redbud is more vigorous, faster growing, and more adaptable than most other kinds of redbud trees. It grows well from zones 5 to 9, and in sheltered spots in zone 4 too. It will grow well in full sun – which we recommend for the best foliage colors – as well as in partial shade beneath taller trees. This variety is more heat and drought tolerant, once established, than most other varieties, so it is a great choice in hotter states. There is just one other similar variety with golden leaves, but it easily burns in hot summers, while this one does not. 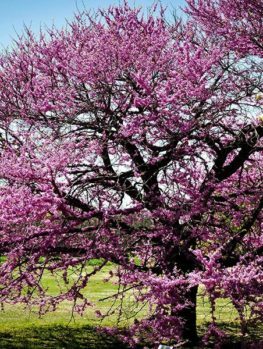 The Rising Sun Redbud grows easily in almost any kind of soil, from acidic to alkaline, and in any type, such as loam or clay, just so long as it is well-drained. It is adapted to poor soils, but it will not grow in wet areas, so plant it on higher ground, or a slope, if you have a garden that holds water in low-lying places. Although pests and diseases are a possibility, they rarely cause any harm, and this tree is tough and reliable, despite its exotic beauty. It needs no pruning, although it can be pruned up into a more tree-like form, with one, two or three main stems, if you wish. Should you see any plain green stems growing from the ground, remove them immediately, as they come from the root system, which does not have the same foliage features. 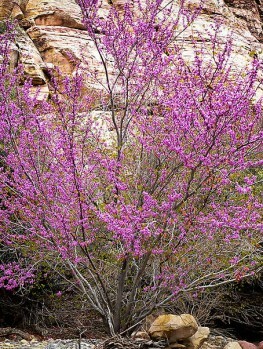 The Eastern Redbud (Cercis canadensis) is one of two redbuds growing in North America. It is found growing from northern Florida to New Jersey, and west to Missouri and Texas, and into northern Mexico. 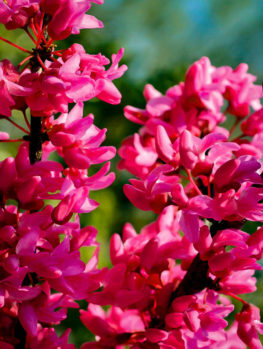 It is more resistant to cold than the Western Redbud (Cercis occidentalis), which is only hardy to zone 7. Ray Jackson owns a wholesale nursery in Belvidere, Tennessee. In 2004 he sowed some seeds of Eastern Redbud, and in 2007 he spotted an unusual seedling among the developing trees. It looks very different, and very exciting, so he studied it and grew more plants from it. Once he was sure of its great properties, he called it ‘JN2’ and in 2010 he was granted a patent on his discovery. The tree is sold to gardeners as The Rising Sun. Our plants of The Rising Sun Redbud are grown directly from stem pieces traced back to that original unique seedling. These are attached by grafting to the roots of seedling eastern redbud trees, to form a single plant. This tree is relatively new, and just becoming known. It has amazed everyone who sees it, and the word is spreading quickly. We know the demand is going to be huge, and we only have a limited stock of this plant. Order now, as our plants will soon be gone.